Seaweed comes free to anyone with access to a beach where ‘beach-cast’ seaweed – that has become dislodged from its hold on rocks and reefs – is washed up on the tide. Seaweed is packed with micro-nutrients and natural plant hormones, it is also full of carbohydrates which are both good for plants and the essential micro-organisms that help form a healthy soil. 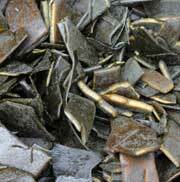 Use seaweed for soil enriching, conditioning and mulching or as a pre-planting pep-up. Particularly useful in autumn, winter and early spring soil preparation for new plantings but generally used all year round whenever it is available. Seaweed breaks down quickest when it is covered in soil – this keeps it moist and in closer contact with invertebrates and micro-organisms that feed on it. 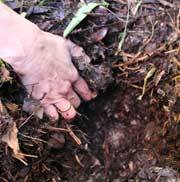 It can be added straight to a compost heaps to boost decomposition. Scatter chopped up seaweed across beds and turn into soil with a spade so that fragments of seaweed and soil are visibly mixed to about a spade’s depth for general soil preparation and conditioning. This makes its nutrients more readily available to fast growers such as lettuce, spinach, peas and beans. Add chopped up seaweed to individual planting holes (maybe a handful or two in most cases) when planting the likes of rhubarb, globe artichoke, zucchini, melon, tomato and other hungry high producers – just mix in with soil at the bottom of the planting hole. Seaweed is also good for lining the bottom of trenches when planting potatoes. Chopped up seaweed can also be dug deeply into soil to help improve its structure and to store nutrients for deep rooted vegetables like parsnip, beetroot, carrot, turnip. Use coils or chopped up pieces as a mulch around planted seedlings like runner beans, tomatoes, cucumbers etc. and fruit trees and bushes – such as blueberry, tamarillo, citrus and raspberries. Freshly gathered seaweed coils, when they are still soft and damp, can easily be chopped up in a wheel barrow with a pair of garden shears before it is added to the garden. 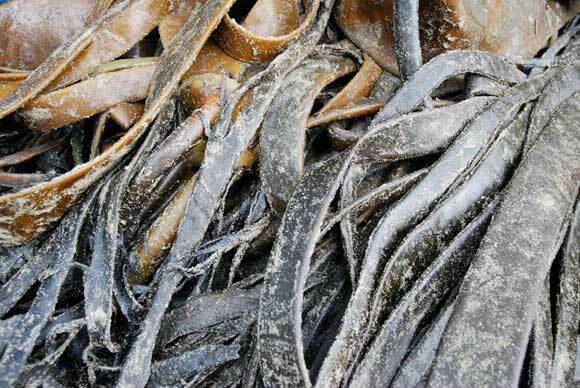 If seaweed is hard and dry it can often be smashed up in a wheel barrow using a spade. Alternatively you can dampen it down with a hose and allow it to re-hydrate before chopping it up with shears. Seaweed is often made into a liquid feed by first washing it and then packing it into a tub or barrel of water to fester over a couple of months into a gelatinous liquid manure that works wonders on the likes of tomatoes. Be aware when you are collecting seaweed that it is part of the natural environment and many small invertebrates – sand hoppers for instance – feed on it. On Stewart Island Kiwis (feathered ones) come down onto the beaches to feed on invertebrates that in turn are feeding on the seaweed. Seaweed gets blown up onto sand dunes and decomposes to provide nutrients for dunes grasses and other plants. If left to rot down on a beach then seaweed will release its nutrients which are effectively recycled back into the marine system. It is good to be respectful with the quantities you take and try to leave at least as much in any part of the beach as you take away. Under the NZ Fisheries Act members of the public are entitled to collect as much beach-cast seaweed as they want for domestic use – ie. sticking it into your own garden. The minute anyone sells seaweed that they have collected they become liable to regulations, quotas and other such constraints because the Fisheries Act views such activity as commercial enterprise.